My colleague was very enthousiastic about the menu. One of the dishes was a baba. I had never heard of that cake, so it inspired me to make some. After some googling I found out that a classic baba is made with a rhum syrup. I decided to make it with orange juice & whiskey. Not a bad choice because the taste was awesome. I liked the sponginess of this cake, it easily absorbed the syrup. Grease a muffin tin with some butter. Create the batter for the babas by whisking 200 grams of sugar together with the eggs. If it’s creamy add the milk, melted butter & sifted flour. If you have a nice mixture you can add the baking powder. Fill the muffin tin with the batter and bake the baba’s for about 30 minutes in a 180 degrees celcius oven. In the meanwhile you can create the orange-whiskey syrup. This is pretty easy, just put the juice of 2 oranges in a frying pan together with the rest of the sugar and whiskey and cook it until the sugar is dissolved. You will get a nice viscous liquid. Pour this syrup over your babas. The best thing is to let them rest for a while. Give them time to absorb the syrup. I tried to speed this process up a bit by cutting the baba into smaller pieces. 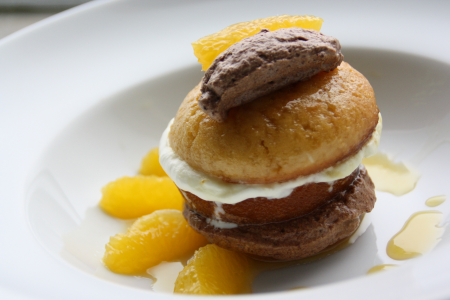 I served the baba au whiskey with some fresh orange and some whipped cream & chocolate whipped cream.